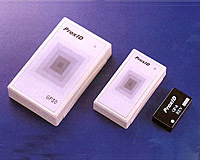 peroxide readers are high performance proximity readers ( RFID ) featuring long range and small dimensions. The same basic unit can be configured to output most of the common interface formats, including Wiegand, Magstripe, Clock/ Data and RS-232 serial ASCII output, making it easy to upgrade existing installations. The readers run from any voltage from 5 to 12.5 VDC and feature high read range at as low as 5 volts making them ideal for a wide variety of applications, in particular access control systems.